"Above Aledo, - in loco fragoso et quasi inhabitabile - on the right hand side between that and Alhama there is a notable sierra (mountainrange) called Aspuña; it´s the tallest in this land and was first discovered by those sailing from Barbary or Lebante for Spain and as such I understand that it has been called Aspuña from Spain, as then the sailors on seeing land give it the name of DSpain; There are in the flat of this land, impressive sights of buildings and antiquities and nearby populations as well as many good and abundant fountains of which the nearby town take advantage.."
This was the description of the 'Sierra de Espuña' which 'Jerónimo Hurtado' made in 1584, natural space of great scenic beauty and enormous turistic interest, situated in the very centre of the region of Murcia, with something more than 25,000 hectares forming part of the Andalusian ranges and stretching between the regions of Mula and the Guadalentín valley. It takes up land from Alhama, Aledo, Totana, Mula and Pliego. Its great natural richness is so important that in 1978 10,000 hectares were declared as a Natural Park and nowadays they are considering the possible extension of its parametres and its reclassification. In addition, since 1973 more than 14,000 hectares have been declared as a Natural Hunting Reserve. Sierra Espuña was one of the first great forestial repopulations in Spain. At the beginning of the century, under the direction of the engineer 'Don Ricardo Cordorníu Starico', a large part of the Sierra surface was repopulated. Nowadays, it´s ICONA (Instituto para la Conservacion de la Naturaleza - Institute for the Conservation of Nature) who are continuing with this work. From an orographic point of view its made up of a heightened massif of deep interior vallies. Its geological materials, the oldest of the Precambrica era were affected by the jack knifing Alpine and are mainly made up of sandstone, dolomite, marl and limestone which have allowed the characteristic formation known as "Karst", giving place to the "Karstico" countryside; produced by the disolving of the carbonites of the limestone rocks eroded by rainwater and snow, like "El Gigante" where the erosion has created very sophisticated shapes in the rocks. Other places of interest are: 'El Purgatorio, Las Alquerías, La Arboleja, El Cerro de las Cabras, La Fuente del Sol, Las Cunas' - from where you can enjoy a beautiful view of the mountainous countryside-; 'La Umbría' or 'Pozos de la Nieve' - which we will talk about in more detail in the Places of Interest. The heights above sea level vary from 200 metres in the areas closest to the Gaudalentín Valley and 1,585 metres at its highest point, the famous 'Pico Morrón' of Totana or Espuña. To the South of this peak you can find one of the other most interesting areas called Collao Bermejo at 1,200 metres, it is a traditional area for hiking. The western area is taken up by 'LLano de la Cabras'. Another point of orographic interest is the region called 'Morrón Largo'. Its climate is Mediterranean with mild temperatures. Cold, but short winters and warm, dry summers. Although Espuña enjoys a microclimate somewhat more humid than the rest of the region, with average annual temperatures ranging between 13,5 ºc and in the cold periods temperatures lower than 7ºc; these temperatures vary with altitude, including reaching below 0ºc at 1,000 metres altitude some days of the year. The average rainfall is around 5000mm, with October and April being the rainiest months. Occasionally, in Spring and Autumn this rain takes the form of hailstones and, although in scarse proportion, in Jaunary and February it takes the form of snow, these months enjoying the snowiest days. The summer months are referred to as the dry period. 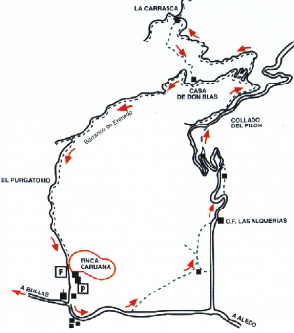 Actual rivers do not flow through the Sierra although some scattered springs run throughout the Sierra: La Carrasca Malvariche, Los Algarrobos, Casa Rosa, streams and ravines which flow into the rivers Pliego and Guadalentín. 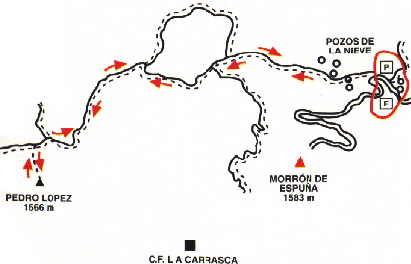 The former recieves water from la Hoz and Malvariche and the latter collects those from Molinos, Arcos, Algeciras, Lebor and Espuña. These streams are the cause of great erosion and drag materials in times of torrential rain, but the erosive action is less serious in the Sierra due to the blanket of vegetation which covers it, as shouold be the case for high mediterranean mountains, but man´s actions and the successive repopulations have transformed it and nowadays the mountainous countryside is dominated by three types of pine groves of repopulation; The Carrasco pine grove - Pinus halepensis - an example of the Rodeno pine grove - Pinus pinaster - and the Negral pine grove - Pinus nigra salzmanni. The highest areas of the 'Sierra Espuña', 'Macizo de Gigante' and 'Carache', their peaks continuosly punished by the wind, exhibit a prickly scrub whose plants are stuck down to the floor, looking like small prickly pillows of little height (they barely reach a few inches) which mix plants known as the "culo de Monja" - Ennama anthyllis ; you can also see black sabina - Juniperus phoenicea - and small dwarf pine scrubs - Quercus rotundifolia. The undergrowth formed by the scrub species like Juniper - Juniperus oxycedrus - , negral espino - Rhamnus lycioides - Kermes Oak - Quercus coccifera - a genista variety - Genista longypes. The small sources of water which are found in some spots of the Sierra form actual small streams with elm trees - Ulmus minosr - black poplars - Populusnigra - or honeysuckle - Lonicera implexa. Small springs also flow to the Espuña riverbed where its easy to recognise some plants such as the maidenhair well - Adiantus capillus veneris - and ferns which live around the springs and fountain sources and which are still used as a way to decorate houses; poplar trees - Populus alba -, willow trees - Salix pedicellata - and the poplar reeds appear on the riverbed of the permanent brooks. The vegetation is always more exuberant in these areas that have stream beds than in the slopes of the mountains. As the vegetation is varied, so is the fauna. In Sierra Espuña there are squirrels, as the pine cones scattered at the foot of the pine trees demonstrate; although they are not usually spotted on first glance, in Spring and Autumn its easy to spot them due to the greater activity, given that at this time of year they collect their food: acorns and pine nuts in order to survive during the winter and in the spring to feed their young. The squirrel which inhabits the Sierra is the grey squirrel - Sciurusvulgaris hoffmanni-. Alongside this species we can find: hares - lepus capensis - rabbits - Oryctolagus curuculus - wild boar - Sus Scrofa - jays - Garrulus glandarius - and snakes - Malpolon monspesularius - . Also, preditors such as foxes - Vulpes vulpes - wild cats - Felix Silvestris - genet - Genetta genetta - which are very adept at hunting. As you go up the masses of the Espuña you can make out birds of prey such as the Golden Eagle - Aquila chrysaetos - the sparrowhawk - Accipiter nisus, kestrel - Falco tinonculus - goshawk - accipiter gentillis - and others like choughs - Pyrrhocarax pyrrhocorax - rock martins - Ptyonoprogne rapestris - . At dusk you can see nocturnal birds of prey like owls - Athene noctua. In addition, there are also sedentary birds like the magpie - Pica pica - and jackdaw - Corvus monedula. In winter migratory birds appear which nest in the Sierra, like the Thrush - Turdus philomelos – and blackbirds- Turdus menila. In the brooks and fountain springs you can find green frogs - Rana perezi - Salamanders - Salamandra salamandra - and, giving beauty and colour to the countryside, butterflies - Aricia morronensis - and reptiles like the angry viper - Vipera latasti - and lots of other small animals which vary according to the habitat that the Sierra provides, whether its forest, rocky places, mountainous slopes, brooks or springs. In 1970 ICONA incorporated the "muflon del Atlas o arrui" - Ammotragus lervia - (similar to mountain goat with twisted horns) to the area, an animal easily acclimatised to the Sierra and which breeds easily. Nowadays more than 500 inhabit the Sierra. 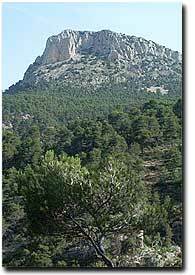 Access to Sierra Espuña, in which Totana shares jurisdiction with Alhama, means you have to go inside a natural park, with its high mountainous land, where you find nature intimately intertwined with man. The main access is via the Aledo road. Leaving behind the 'Santa Eulalia' Hermitage, some 3km from the town, a tarmaced forest road on the right leads you to the Southern side of the Sierra towards 'Las Alquerías' and 'Collao Bermejo'.